After Joseph Pilates brought his method to The United States, it quickly gained recognition and devotion from the ballet and dance community. Martha Graham, "mother of modern dance", was an early follower of the Pilates Method. She and many other instrumental leaders recognized that the integrative strengthening and conditioning provided by the Method could break the cycle of imbalances and injury common to dancers' demanding routines. 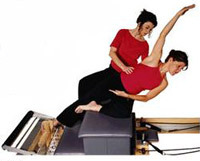 The intelligence of the Pilates Method, with its symmetry, fluidity and precision, enables you to create balance and strength unique to your body's qualities. Through the efficiency of articulate movements and basis in core strengthening, the Pilates Method dynamically creates positive change that translates into all other areas of your life. Standing on the beach one day, a woman approached me with an effusive compliment. She asked me what I had done to look so healthy and trim. I turned to her and said simply: "Body by Astrid." Quality needs no further explanation.